As I sit here typing, I will admit, it hasn’t been the greatest past several days or so. I have been emotional. I have been nothing but a roller coaster of ups and downs. I have snapped. I have broken. I have all but given up completely. Yet, after it all, for some reason, as I sit here typing today, things don’t seem to be quite as terrible, quite as tough, quite as painful. They say time heals and maybe that’s all we need some days is a little bit more time. Maybe that’s all I needed. I don’t have any insight, any answers, just wanted to share that it’s been a tough week but for some reason, where I am sitting right now seems like not such a bad place to be. And I’ll take it, even if it’s only for a brief time. 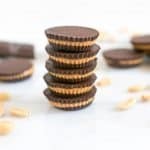 Peanut butter and chocolate. Chocolate and peanut butter. Doesn’t matter how you say it, it always goes perfectly together! When it comes to clean eating, peanuts don’t always have the best reputation. They are said to cause inflammation by some. When I looked a bit recently, there are more layers to this than meets the eye. From what I can gather, a lot of the issues have to do with the amount of processing our peanuts go through now versus 50 years ago. I am certainly no expert, but that seems to go along with a lot of the issues we see today. If you are able to eat peanuts, it’s certainly best to get organic and nonGMO certified, especially if you eat as much of it as I do! 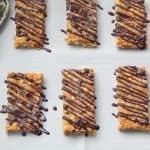 Not too long ago I shared the Toasted Cashew + Chocolate Chip Granola Bars. 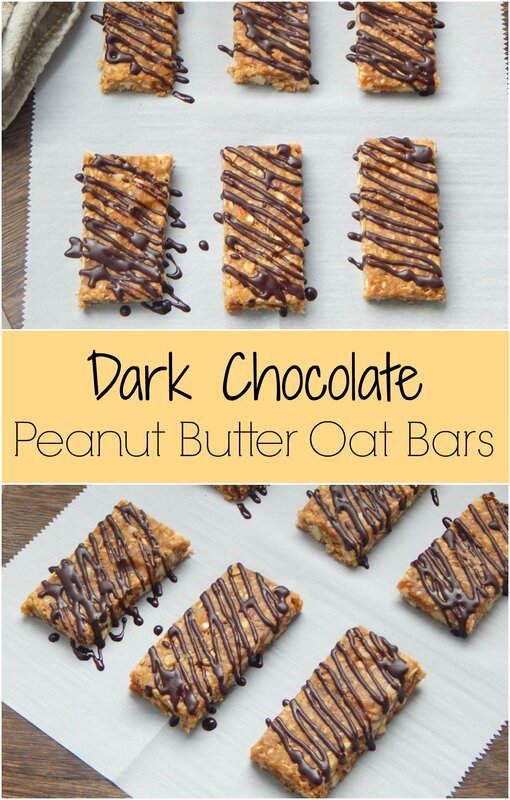 These Dark Chocolate Peanut Butter Oat Bars are ultimately a peanut butter version of them. I upped the ante though with the chocolate drizzle. Feel free to do chocolate chips instead if the drizzle is too daunting or just not your thing. If you are able to toast the peanuts and almonds please do. It really seals the deal on these! If you find yourself without peanuts, don’t worry. I have used cashews instead several times and still enjoyed these. Also, if you are really not a fan of coconut flavor, use refined coconut oil for the chocolate drizzle. My husband is not a fan of coconut and ate these with the unrefined coconut oil in the chocolate with no issue. But if you really can’t do it, go for the refined. It’s more processed than the unrefined, but for some that’s just the way it has to be! Toast peanuts and almonds about 7-10 minutes at 350°F or until a light golden brown. In food processor pulse to chop peanuts and almonds. In sauce pan melt peanut butter, maple, and vanilla on low until combined and smooth. Combine all other ingredients in mixing bowl with dates and then add nuts and peanut butter mixture. Stir to combine. Chill for about 30-45 minutes. Once chilled, you can cut first or add drizzle before cut. Whisk together chocolate drizzle ingredients in a small bowl. Transfer chocolate to a small plastic bag or icing pouch. Cut small hole into bag and drizzle chocolate over bars. 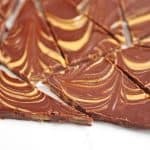 Allow chocolate to chill for about 5-10 minutes to set and then ENJOY! If your dates seem a bit dry, soak them in hot water for about 10 minutes and then pat dry before processing. Natural nut butters tend to be a bit dry at the end of the jar if they aren't stirred extra well in the beginning. It's best to use the beginning or middle of the jar to avoid these from being too dry. So sorry you’ve had a bad time of it. I hope your “better” day leads to a much better week and month! ☺️ I enjoy your posts and wonderful recipes! Keep up your great work! Praying for you…? Thanks so much Julie. Just hit a rough patch over the past week but things have been looking up the past two days so I’ll take it! Thanks for the prayers and kind words ?